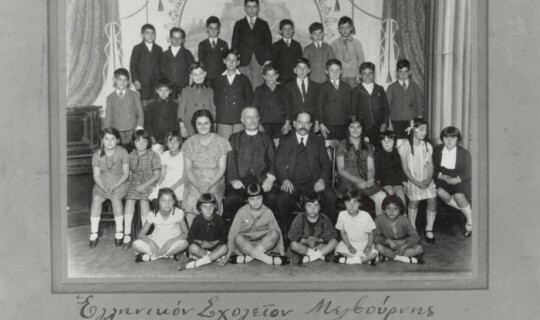 The Greek Orthodox Community of Melbourne and Victoria (GOCMV) not only played an integral role in the provision of religious services for early Greek migrants but was also instrumental in educating children in Greek language and culture. Although the GOCMV archival documents prior to the 1920s make no reference to the establishment of Saturday or afternoon Greek Language Schools anecdotal evidence suggests that the Greek language was taught at the Holy Church of the Annunciation of Our Lady once it was erected in 1901. Most likely private Greek language tuition classes were provided to children of then Greek migrants by the serving priests of the time. The first written reference to the establishment of a “Greek School” can be found in the first volume of the GOCMV minutes from a Board Meeting on February 3rd 1921. During that meeting, Board Member Mr. Aristotelis Papalexandrou noted that one of the most important matters confronting the organisation was the “establishment of a Greek School”. At the very next the Board meeting dated February 17th 1921, Mr. Aristotelis Papalexandrou re-emphasised the need for a Greek school to be established under the supervision of the Church within one of the three Greek organisations operating at the time, the GOCMV, Orpheus and Ulysses. The establishment of a Greek school proved to be more difficult than originally perceived. At the Greek Community’s Annual General Meeting dated February 22nd, 1922 Archimandrite Kassimatis moved that a “school be established and erected to foster and embrace the Hellenic ethos”, the motion was seconded by Mr. Marinos Lekatsas. Under the proposal “a two storey building is to be erected at the rear of the Holy Church of The Annunciation of our Lady that will house both a school & a residence for the Priest”. The plans seemed promising and at the end of the meeting 530 Pounds were collected to go towards erecting a school building. A three-person committee was also appointed for the purpose of establishing a “Greek-English Lyceum” the committee consisted of Mr. Marinos Lekatsas, Mr. Nikiforos Lekatsas and Archimandrite Kassimatis. Unfortunately the efforts failed and due to internal differences and ongoing court cases that plagued the organisation nothing transpired and the plans were put on hold. By 1923 a Greek School was established but it folded the following year. It was not until 1929 that the GOCMV established its own Saturday school under the guidance of an independent school committee with Dimitri Mavroidis from Kalovrassi, Samos, as the headmaster. The School was initially based at the 3rd level of the Clarke building on Lonsdale Street, Melbourne. In 1946, the Community leaders outlined an elaborate visionary plan that was to transform the recently purchased “Illoura property” at 424 St. Kilda Rd, into an Educational & Cultural Centre. Once again, however nothing transpired and the Illoura property was sold in 1960. Operating from 343 Bourke St Melbourne the GOCMV was the sole provider of Greek language classes up until 1957. 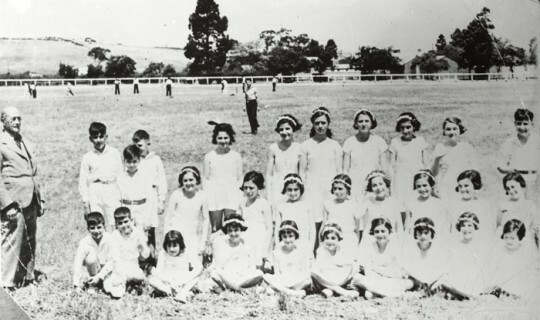 With post-war migration the Greek Community expanded its campuses to include nearly all of Melbourne’s inner-city suburbs. In the next three decades the Community Schools at times reached annual enrolments that exceeded 2000 pupils. It is now estimated that over 60,000 students have attended the Greek Community’s Saturday and Afternoon Greek Schools since they were established. In 1989 Alphington Grammar was established by the GOCMV; it is a non-denominational school that embraces cultural diversity. Situated on Old Heidelberg Road, Alphington, the school has been operating for 22 years under an Independent School Committee. This year the school will have an additional eight new classrooms and a multipurpose hall with a capacity that exceeds 800. Today the Greek Community provides Greek language classes through six main campuses with over 850 enrolments, making the organization the largest provider of the Greek Language in Victoria. The majority of those students enrolled are 3rd Generation Australian Greek with a high percentage being from mixed marriages. Currently the GOCMV employs over 60 teachers and the teaching of the Greek language, culture and history are deemed by the Board of Management as a priority, helping to enrich Melbourne’s Greek community with an understanding of its heritage and ethos.